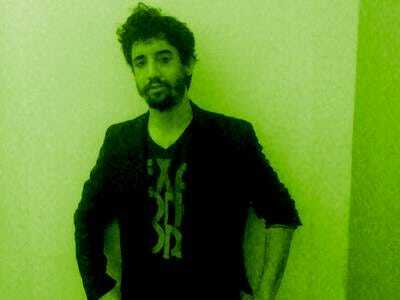 My name is Joe Weisenthal. 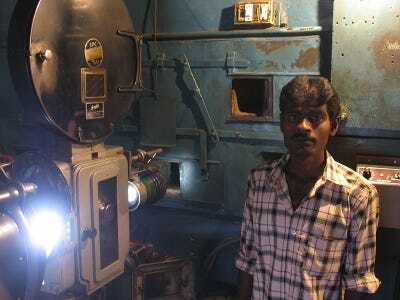 I am an action junkie. I like to play chess in Washington Square park for $2 a game. 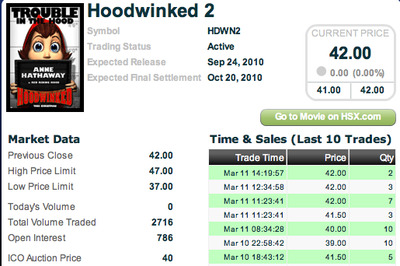 I play online poker, and I used to bet on politics on InTrade. I’ll take most wagers, either side, if I feel the odds are reasonable. 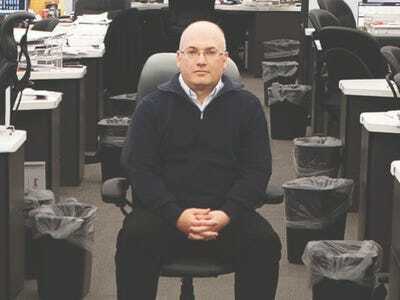 The problem is, due to regulations, funding online poker sites and InTrade is a pain in the arse. Our government has a silly attitude towards gaming. As such, I can’t wait for Cantor Fitzgerald to open up its real-money, moving-futures trading platform, the Cantor Exchange. 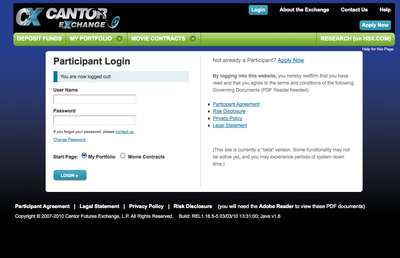 The Cantor Exchange is the outgrowth of the Hollywood Stock Exchange, a play-money site the firm bought nine years ago. 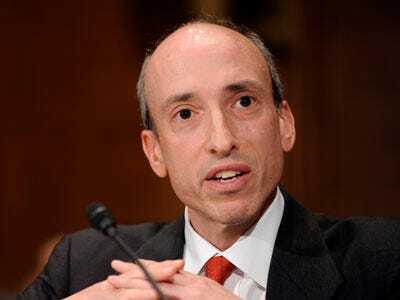 Near the end of April, it’s finally going real money, having experienced various setbacks, including 9/11 (Cantor Fitzgerald was devastated in that attack), as well as the thicket of regulatory bureaucracy. Every movie that comes out will have a tradable “share” to to speak, whose value will end based on the four-week opening box-office haul. 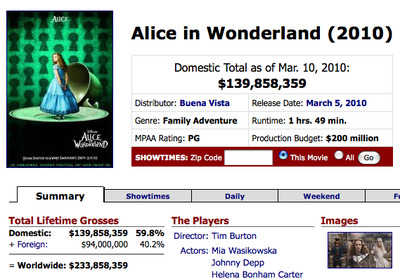 So, for example, if a movie does $100 million in four weeks, the share will end at $100. 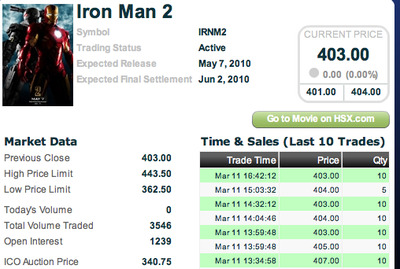 The trading begins four months before the movie opens, and from then on, traders buy and sell the shares, based on how they think the film is going to do. 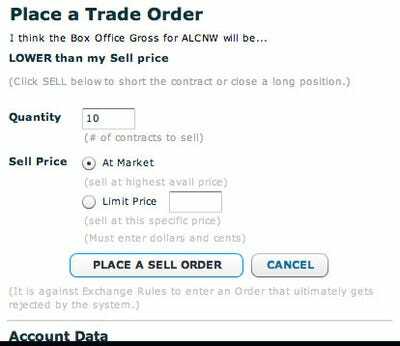 With any luck, the Cantor Exchange will appeal to three groups of folks: Studios (looking to hedge their exposure to films), hedge funds (who want to speculate on films) and normal folks, who want to trade films like they do stock. Earlier this week, we got a tour of the site from President Richard Jacobs, who picked up the project in 2007. 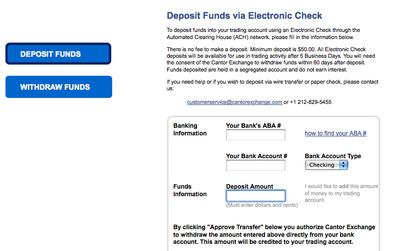 But already there's a screen for depositing money. And guess what, you can participate for just $50! That's it! The site will open for real money at the end of April. 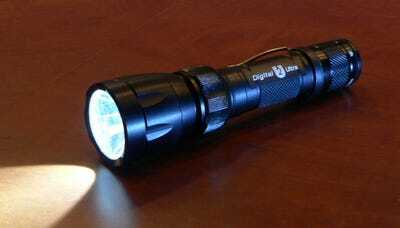 The big challenge has been regulatory. Cantor needed to convince regulators that there was a legitimate economic value to this service, and that it was not gambling. So let's look at the action. 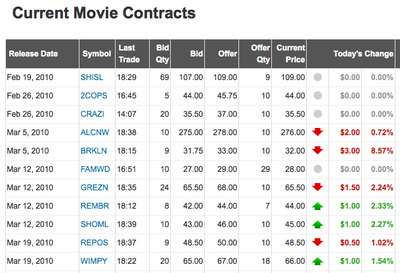 Here's a look at current movies that are trading right now. 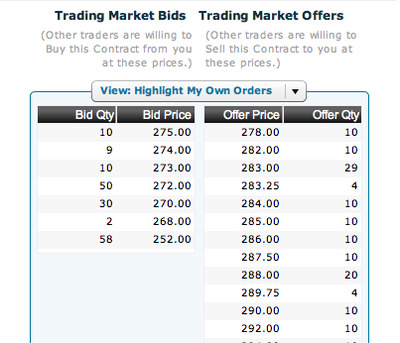 Contracts that are set to expire soon are near the top. This is the big momma trading right now. 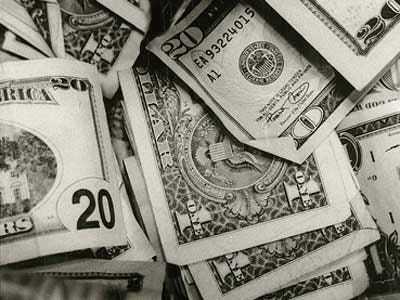 The market expects the final, four-week haul to be $276 million. 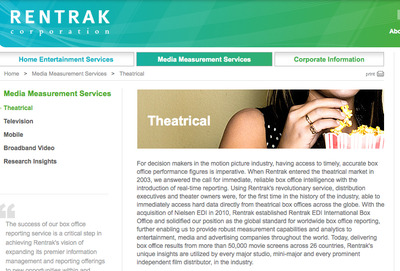 Data is actually collected by this company, Rentrak. They're publicly traded. 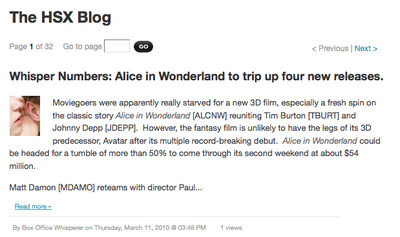 Here's a deeper look at the Alice in Wonderland data to date. Want to do some research? 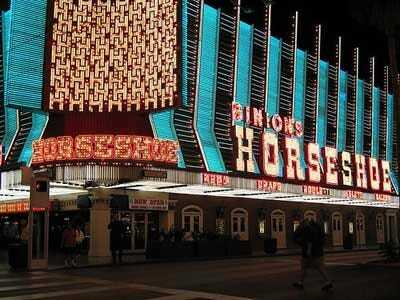 Go to HSX.com -- Cantor's sister site -- and get the inside scoop. 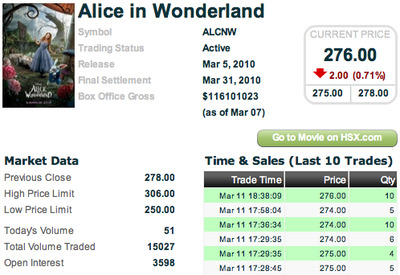 This is how you short 10 shares of Alice in Wonderland. Here's our portfolio after one trade. 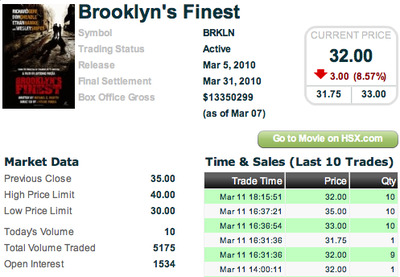 Now let's check out some others: The market isn't too optimistic about Brooklyn's finest. Same too with Iron Man. The market expects a $403 million four-weekend haul. Yeah, sorry. 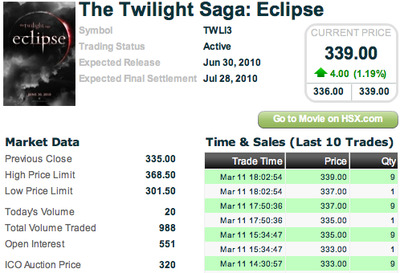 We have to short this Twilight nonsense. We decided to short Twilight. 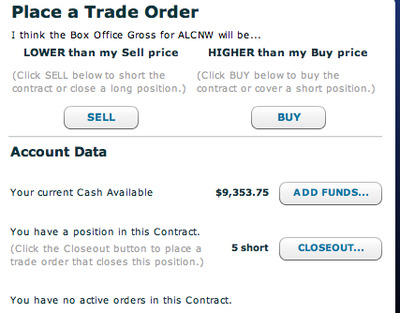 Just like with your online broker you get a pending trade announcement. And you get a confirmation. 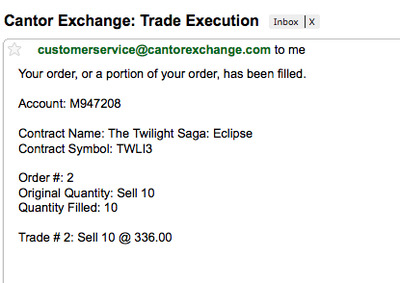 When you make a trade, you also get emailed a trade confirmation. Oh jeez. An animation with Anne Hathaway. SHORT! So how can you get an edge? 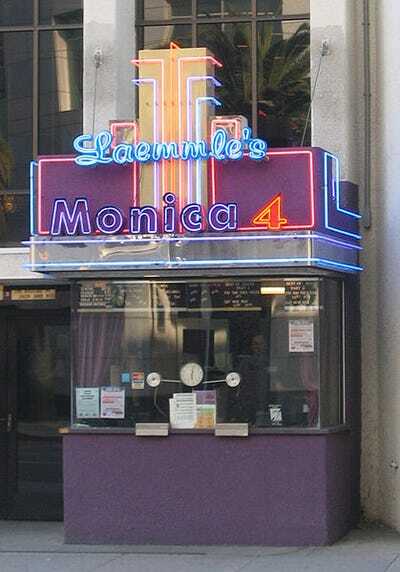 Well you can buy services that do channel checks on box office receipts. And you can learn to analyse patterns. 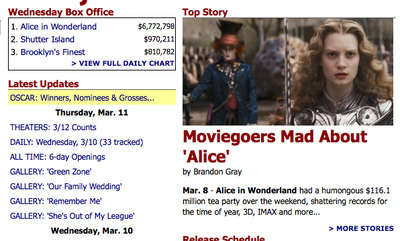 Look at how no other movie is opening the same weekend as Twilight. But be careful. Insider trading is ILLEGAL! If you know, say, a movie's marketing budget is going to be slashed, and it's non-public, you could get into serious trouble. There are probably grey-area ways to play the market. Like getting in good with the folks behind the scenes. That's probably how hedge funds will seek to gain their edge. 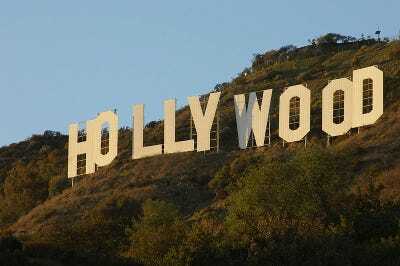 And if there's enough liquidity, Hollywood will follow. Don't expect studios to start trading for a while, however. Cantor is going to hate me for saying this (since the site isn't quite cleared for takeoff yet), but this is totally going to fuel my desire to gamble. 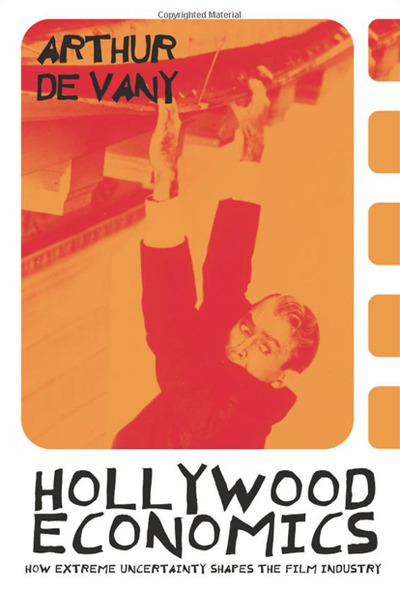 If you do get into movie trading, we HIGHLY recommend you get into this book.